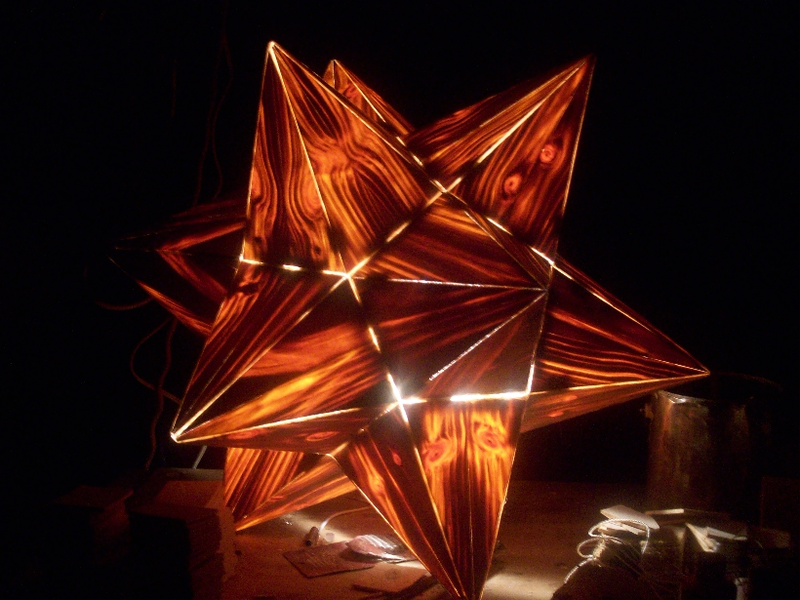 Here's a project that my brother Jeff Bowers has been working on - wooden objects that we call "knotboxes". 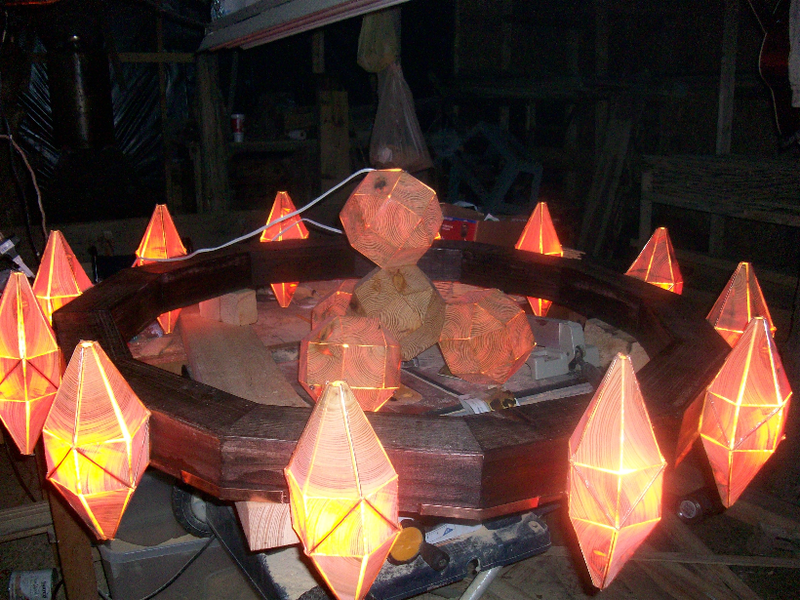 The beginnings of this project took place on a winter nearly 10 years ago. 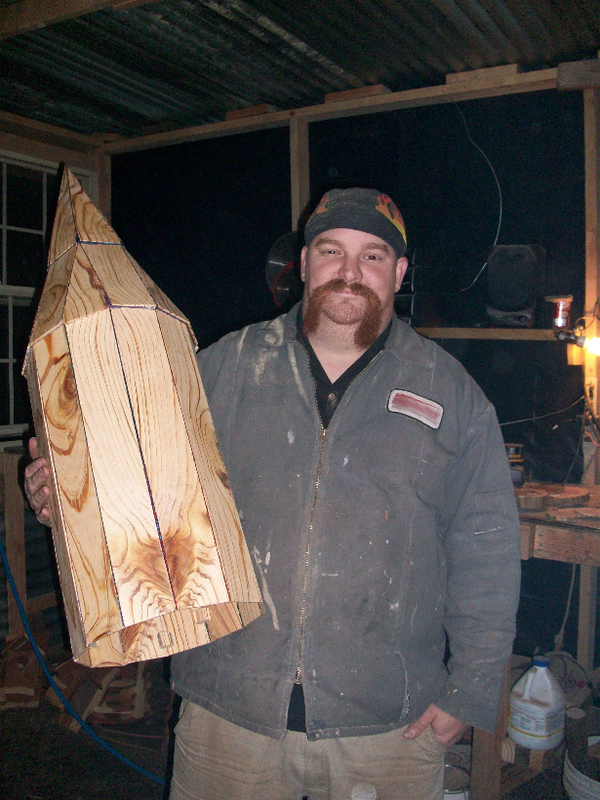 Jeff, who is a painter by trade, was working on a log cabin in Van, Texas. He was spraying the house with clear lacquer. He had one more room to spray, the laundry room, when it was getting late and he was getting tired. He had to use spotlights due to the house getting dark, but only enough electric cord to get the spotlight into the doorway, but not into the room. Jeff sprayed everything in the laundry room except for the back of the door. 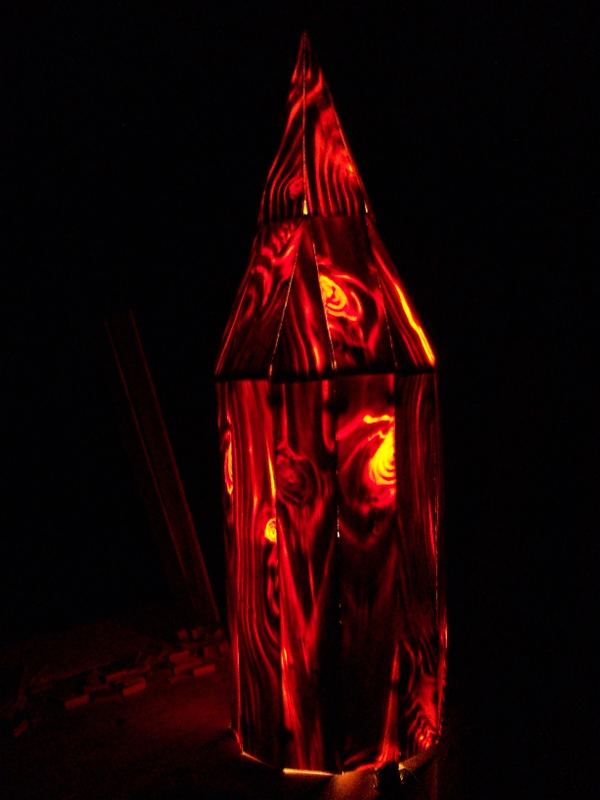 When it was time to do the door, he shut it and the room was dark except for one small spot on the door, a knot in the wood, which was translucent and glowed with an red glow. At the instant he looked at the knot, he clearly heard a phrase spoken in a powerful reverberating voice - "DON'T FORGET THE KNOTS !!!". Jeff took a step back, fearfully and quietly said "O.K." knowing that he heard from God. He was on a mission to find a source of pine wood that had these translucent knots in them, although he had no idea what he was going to do with them. After a bit of searching, he asked God to help him find these knots. The next place he looked, which was the original place he started looking, he found them. 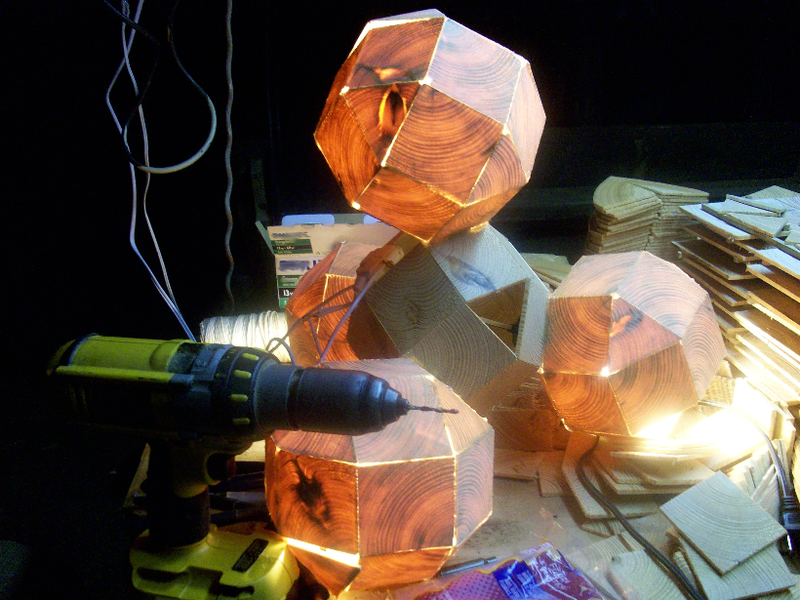 He decided to make a simple box out of this knotted wood and put one of those curly light bulbs inside, when turned on made the knots glow - this was the first knotbox. He grew more passionate about making more knotboxes and to make them more beautiful, so he made several more. 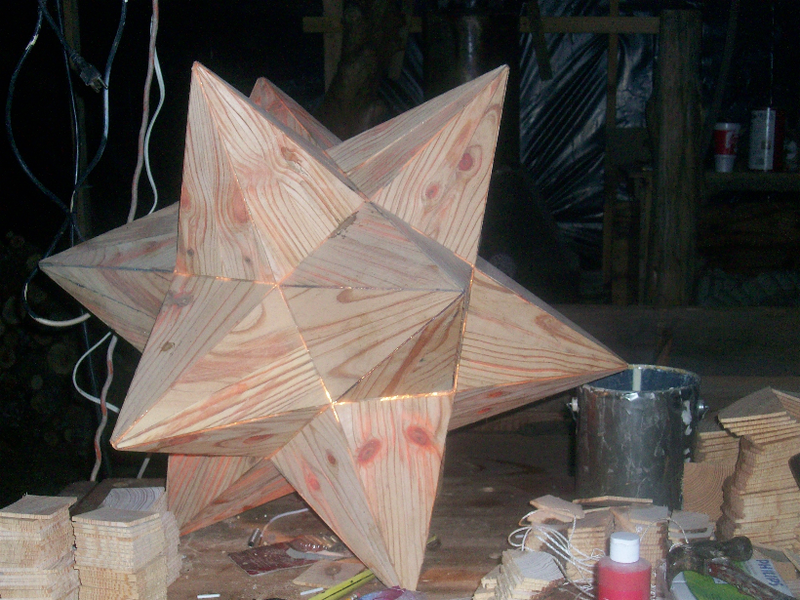 I even helped him to make some polyhedral ones by giving him the designs. We all wondered if there was some sort of purpose or meaning behind these knots, so Jeff asked a pastor that he knew and told him about this. 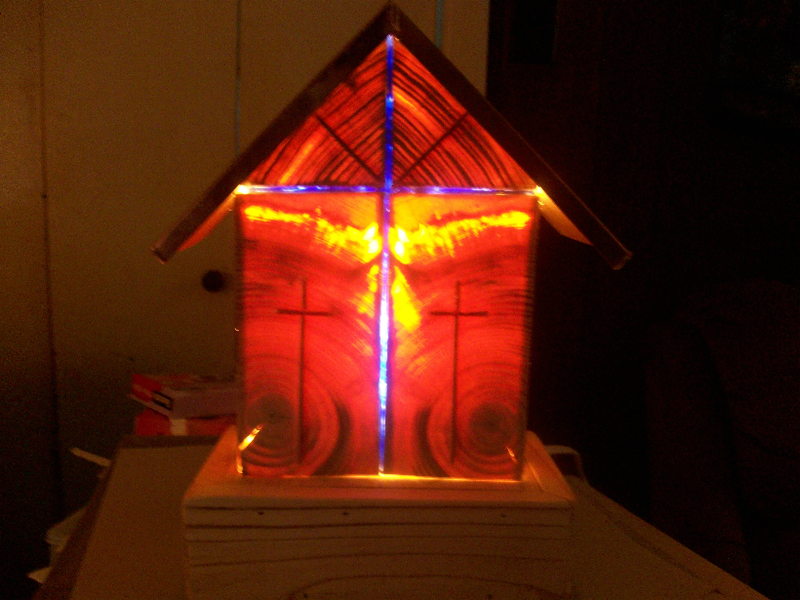 The pastor told Jeff that the box represented our temple (our body or our life), the knots represented the scars of sin and imperfections, and the light represents God's light within us (Truth and Love, Christ himself). 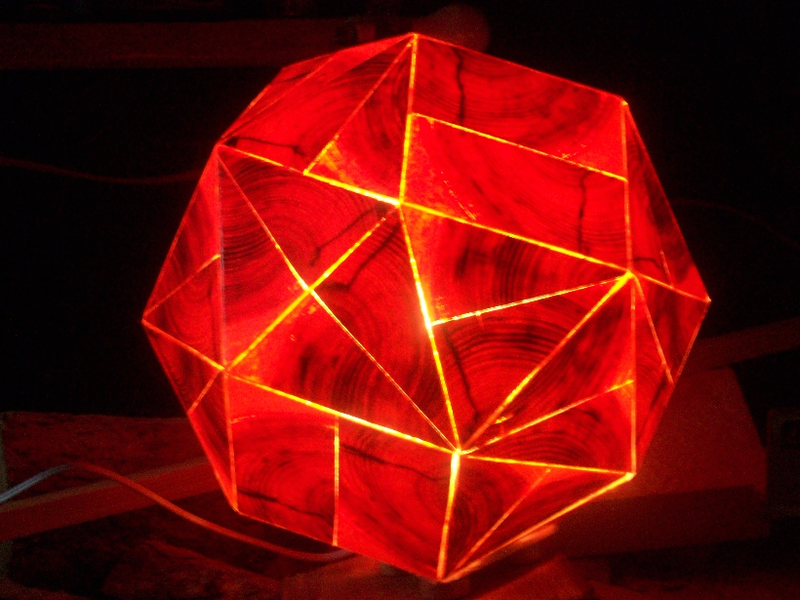 When the light shines within the box, it can turn a drab looking object into something beautiful and spectacular, the way God intended us to be. 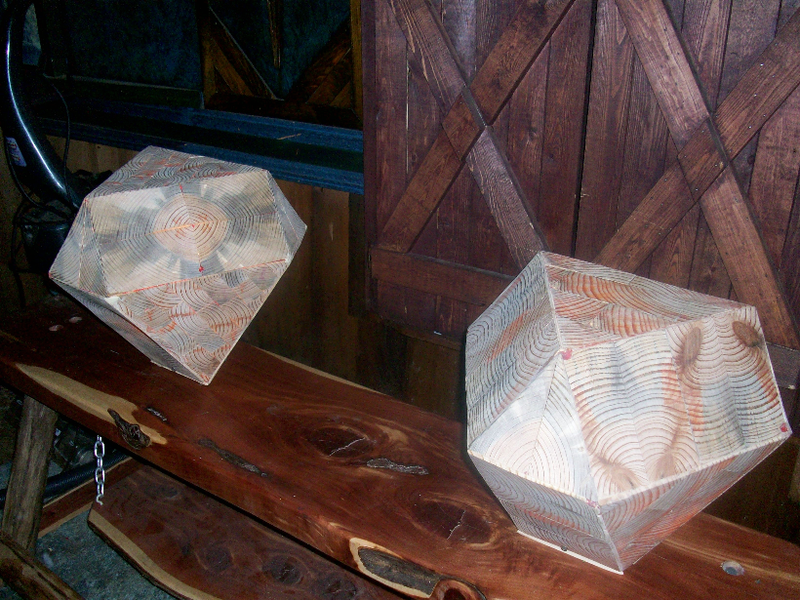 In 2010, Jeff had built many more knotboxes and gave some away as gifts, I helped with some polyhedral based ones. 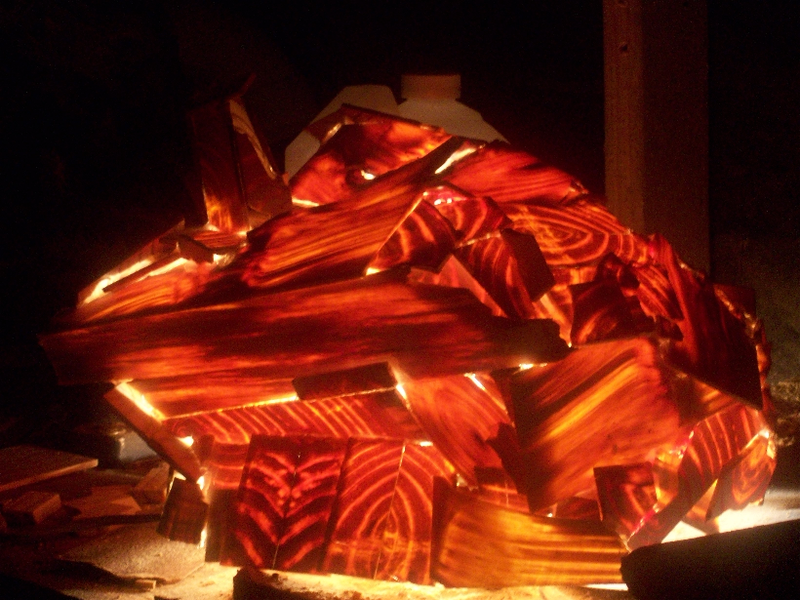 Jeff's passion in life is to reach as many souls as possible with the wood craftsmanship that God has given him. 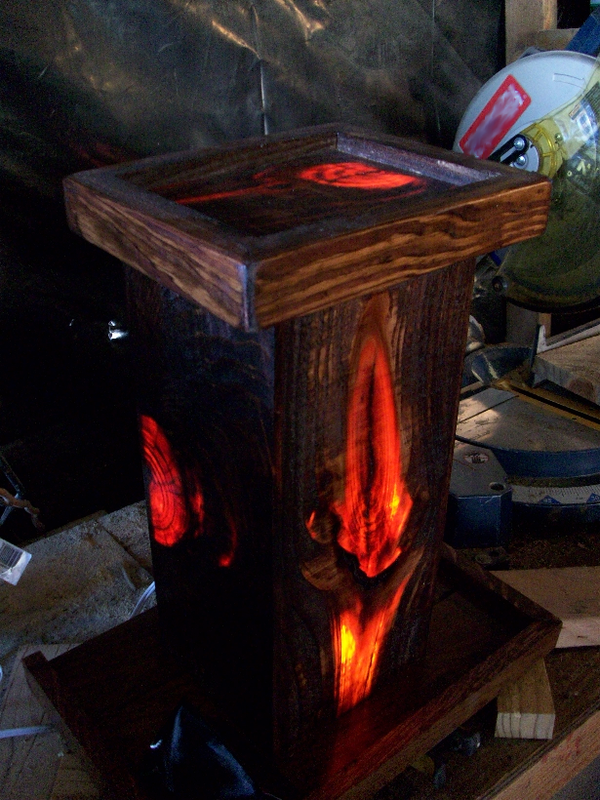 Below are some pics of these knotboxes - enjoy. Below in order: Jeff holding the "rocket". Typical knotbox when turned on. Church shaped knot box, Jeff made several of these as well as cross shaped ones. The rocket glowing. 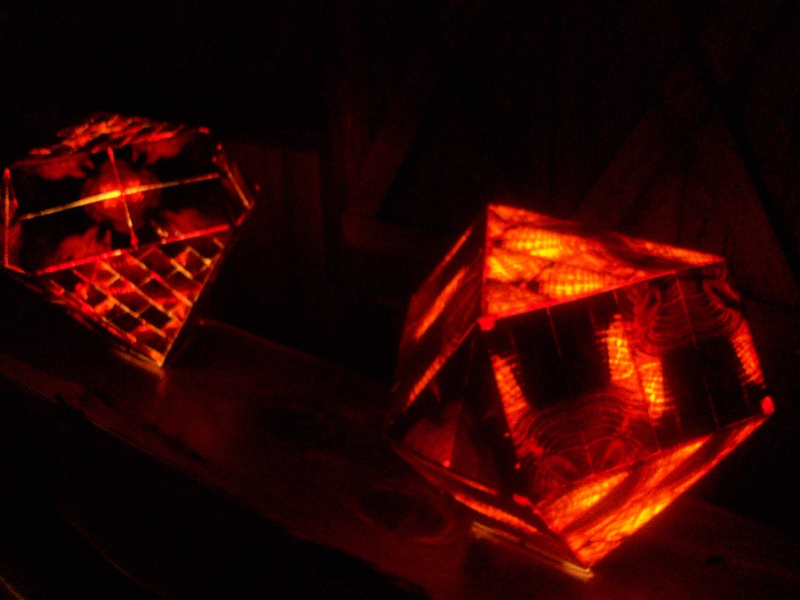 Next are some polyhedral ones: Two "jewels" which are shaped like the rhombitetratetrahedron. The same two jewels glowing. Sissid shaped box. Same box glowing. 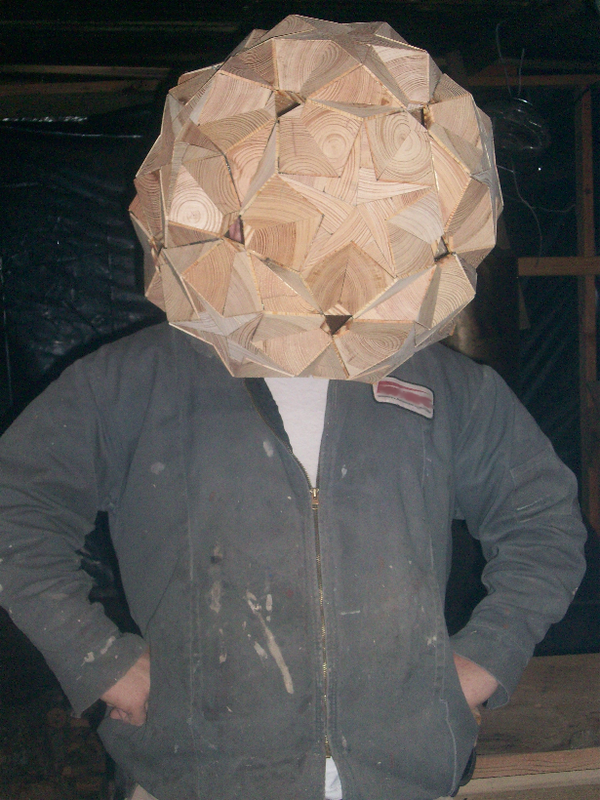 Jeff with a raded shaped box on his head - this box never got finished. 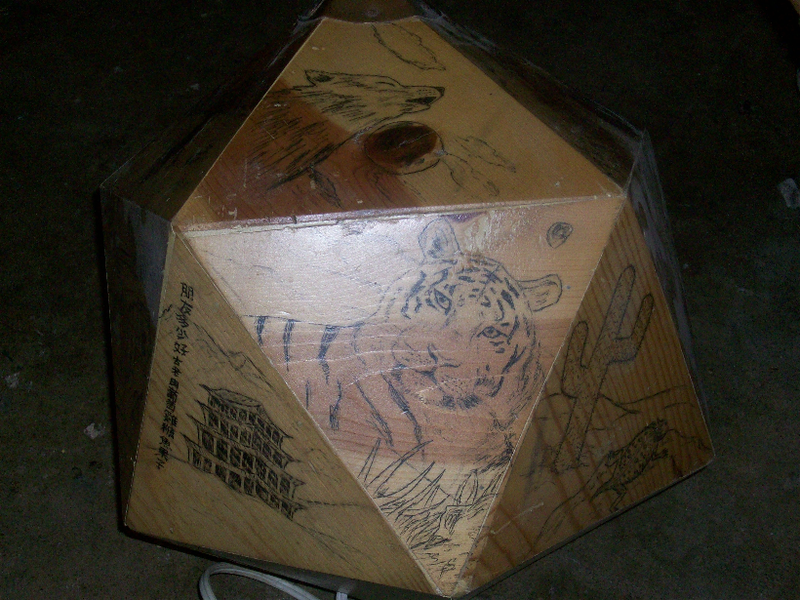 Snic (snub cube) shaped box. 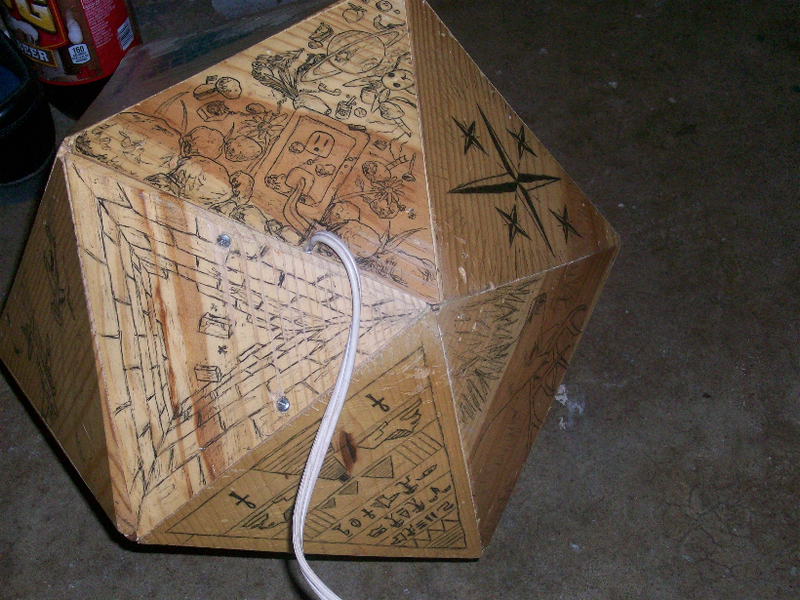 Two views of an ike shaped knotbox with drawings that I drew on it. 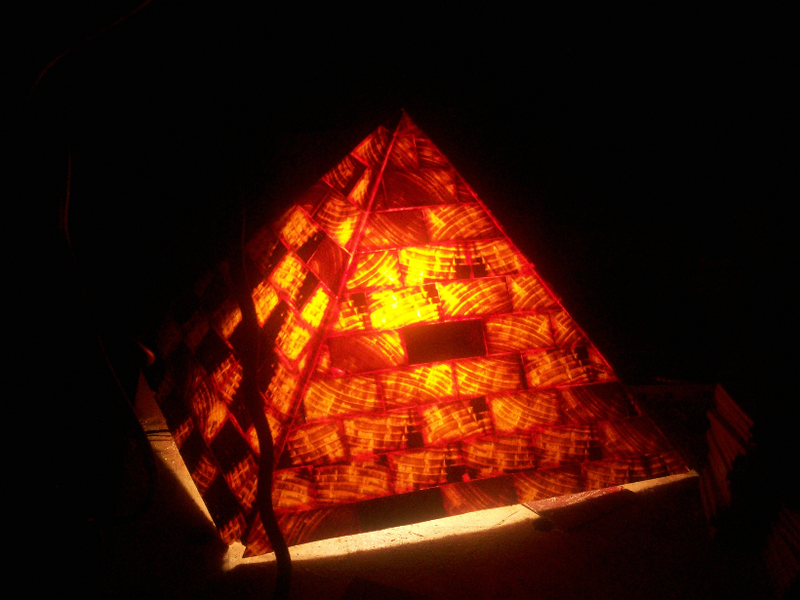 Next are some miscellaneous ones: Pyramid. Something we randomly threw together. 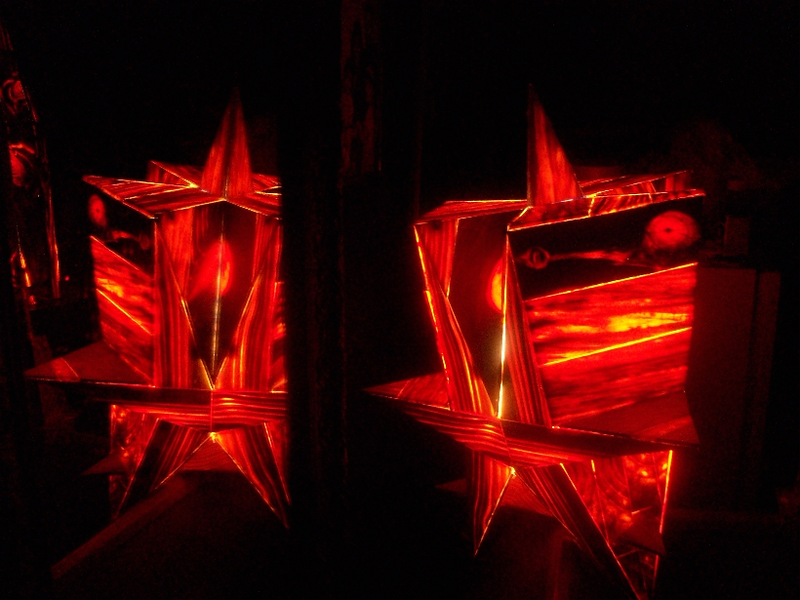 "Mr Mustachio" which I helped Jeff turn some stars he made into a crazy looking polyhedron. The molecule made with five sircoes. 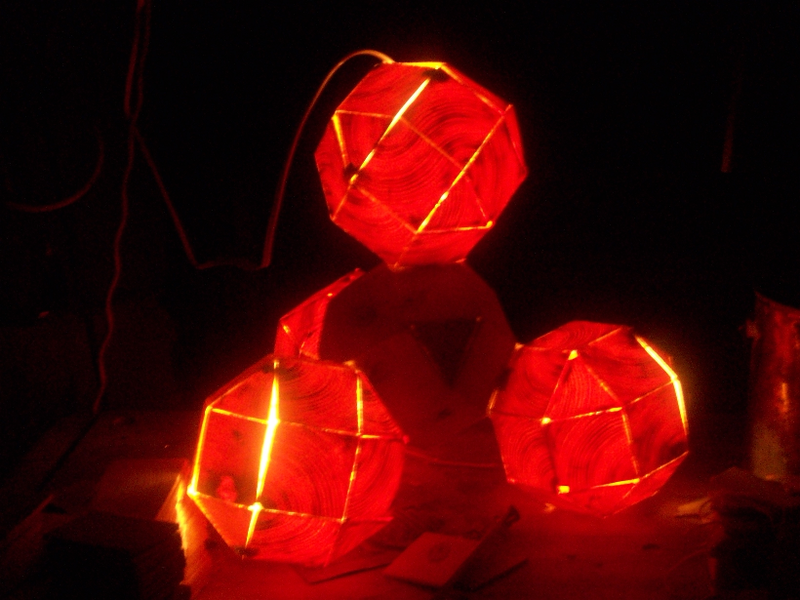 Molecule with outer four sircoes glowing. 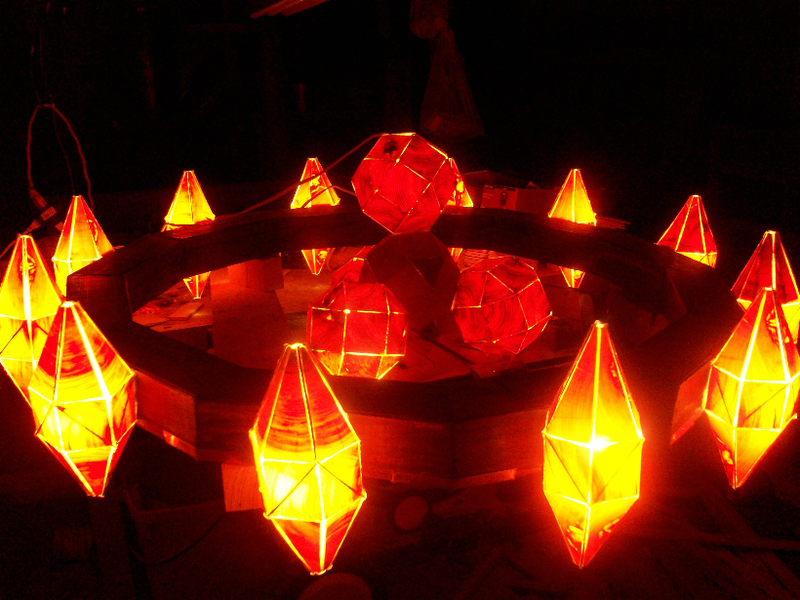 Twelve sided chandelier. Chandelier glowing - this one was stunning.